The image of the "A. D. Vance" by Samuel Walters, posted at Your Paintings, is copyrighted by the Glasgow Museum and used here with permission. Attached are two photos of the Confederate blockade runner CSS Advance. 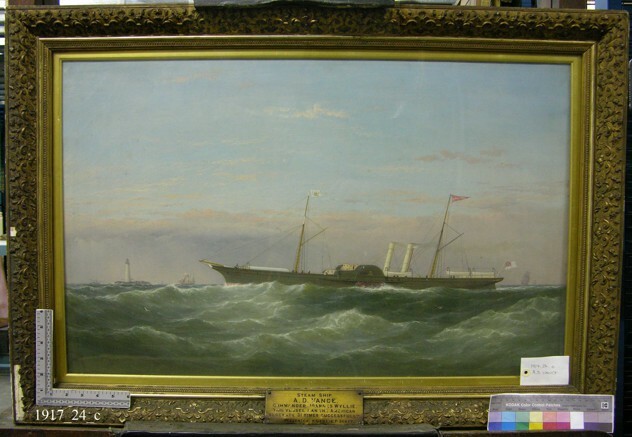 This is painting by Samuel Walters in the collection of Glasgow Museums, Scotland, and shows the paddle steamer running the Union blockade of the Confederate States. I am interested in the flag on the foremast. 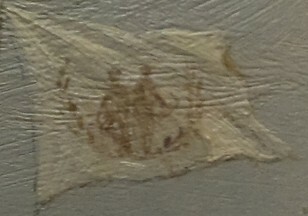 The close-up shows the flag, which appears to be a white field with a gold motif of two figures surrounded by a wreath. The CSS Advance completed many runs of the blockade before being captured by the Union navy and being renamed USS Frolic. The emblem enclosed by a wreath on a white field looks rather governmental. We can read everywhere on the net that the Lord Clyde was bought jointly by North Carolina and the firm of Lord, Power & Co., to become the CSS Advance. Most of these mentions appear to stem from the Dictionary of American Naval Fighting Ships. They are however, the only mentions I can find of that firm, as if it served only one purpose: The financing of a state blockade runner. That would mean that effectively the Advance had only one owner: The State of North Carolina. In all, it looks to me like this is a N.C. state flag, either specifically for the Advance, or for some North Carolina naval purpose. 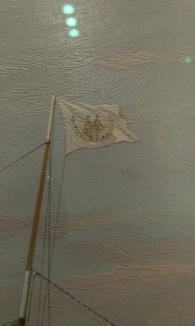 It would be interesting to know whether other North Carolina ships in government service flew flags at the time. I think I have now solved it. Thanks to the help of staff at the Museum of the Confederacy, I was led to the idea this was the state seal of North Carolina. I had a look online and found the following publication The Great Seal of State of North Carolina, 1666-1901. If you look at page 23, you see the state seal from 1836-1883. I think the figures are a match (also, consider the actual size of the flag on the painting is about 1 square inch, so details are hazy).